Since leaving my last job, the Can-Can speakers have been sitting around collecting dust. I decided to re-use the Aura drivers as a computer speaker to replace a set of Altec Lansing multimedia speakers. 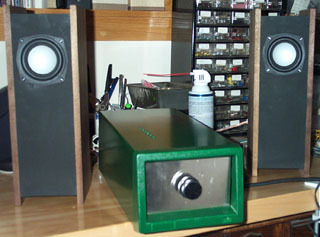 I built new speaker boxes and mated them with a more powerful amplifier. 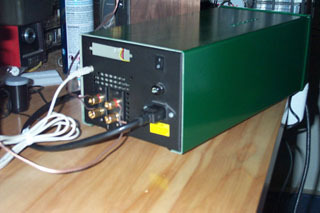 The new amp is based on a pair of National Semiconductor LM3876 amp-on-a-chip and powered by a 25.2VCT transformer. The entire contraption is mounted inside an old Exabyte SCSI tape drive enclosure. 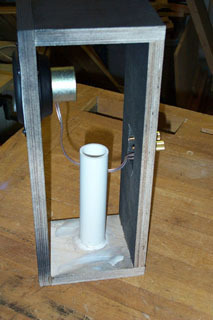 External connections consists of a 1/8 inch stereo phono input jack and 5-way binding posts for left/right speaker outputs. 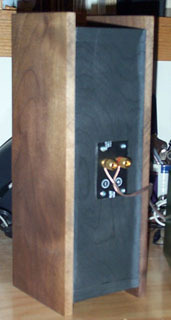 A single volume pot decorates the front panel. The new speaker box is made from some material I had in the garage. I made the top, bottom, front and back from 5/8 inch void-free birch plywood while the sides are solid walnut. Using solid wood (lumber) is not a very good idea since it can move (expand and contract) with environmental changes. In this case, the room I'm using it in is fairly consistent in humidity year-round. Hopefully, this feature, and the relative small size of the box will keep the box from splitting. Time will tell. I don't have a lot of time invested in this project so if it were to fail, I can always rebuilt it. The Aura driver is mounted towards the top part of the enclosure to better align with my ear height when I'm sitting in front of the computer monitor. The port is vented at the bottom of the box. Box volume is 0.10 ft^3 and the 1 inch ID vent is about 5-3/4 inches long. The pictures here were taken before I applied a water-based polyurethane to all surfaces.